The rain started during the night, and we awoke to the steady thrum of big drops hitting the metal roof of our cabin at Wollaston Lake Lodge. The forecast called for things to get significantly worse as the day wore on, so our guides–Dan and Phil–chose a couple of bays not far from the lodge, which would allow us to beat a hasty retreat when the wind and rain increased. 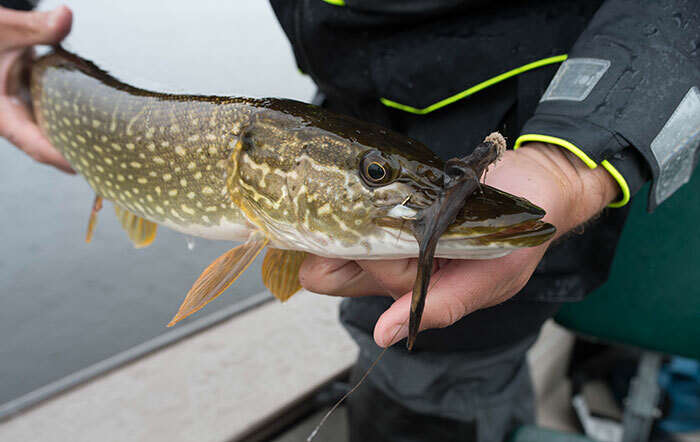 After he cut the motor, Dan said to me, “If you’re gonna get a fish to eat that duck, this is as good a spot as any.” We’d thrown the Pat Cohen Mallard Duckling pattern for a little bit the day before, to no effect, but I was determined to catch a pike on it. The mouth of a long slough at the end of the bay looked pretty darned fishy, featuring lots of lily pads and grasses, so I was hopeful. The mouse was hot for about an hour in the morning before the approaching front seemed to shut down the action. The Duckling is not exactly a dream to cast, so I gave it about fifteen minutes before I had had enough. Sandy, who is a mouse-fly fanatic, suggested we try some rodents and brought out his vast collection of deer-hair patterns. We chose a big one, about six inches long, on the theory that bigger is better. 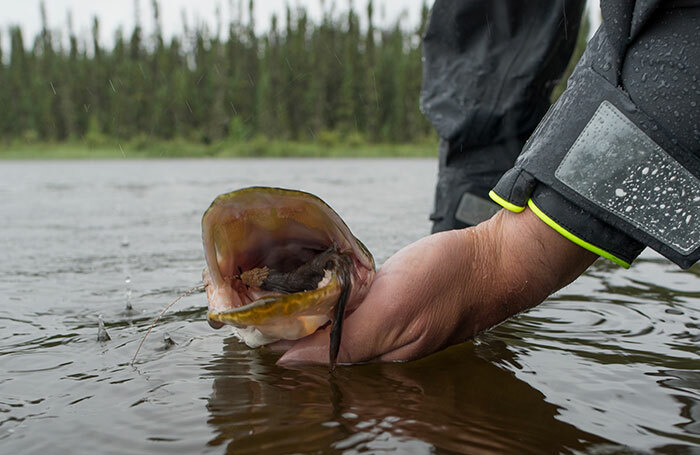 On about the fourth cast, a fish exploded on the fly but missed completely–something northern pike are known to do–so we knew we were onto something. Just a few minutes later, I dropped the monstrosity in a gap between two sets of lily pads, gave it a couple of strips, and a big, green body came out of the water, arched its back, and slammed the fly on the way down. It was an incredible take, and the fish fought hard before coming to the boat. Once we’d landed that fish, I asked Dan to put the duckling back on. 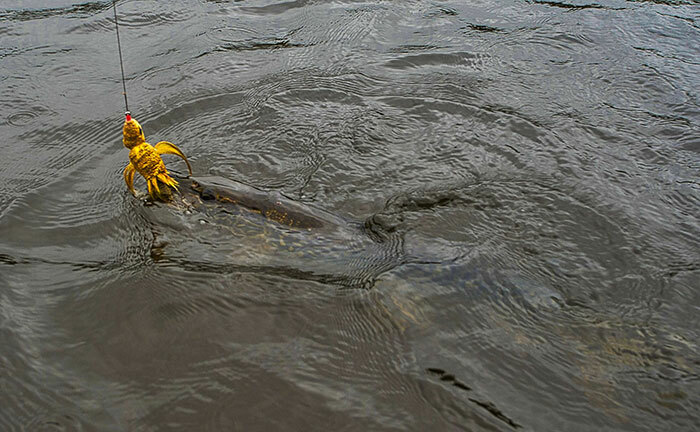 Several casts later, it was mission accomplished, as a pike whacked the duck in open water. The fish wasn’t that big, but we were all psyched that the bird fly had produced. Success! I guess that northern pike do like baby mallards. We were able to fish for about an hour longer, getting plenty of strikes on various mouse patterns, before Dan pointed over my shoulder and said, “Look what’s coming.” A terrifying line of heavy rain and wind was marching across the lake from west to east, so we reeled up and dashed back to the lodge, barely beating the monsoon. Things are supposed to clear up by afternoon tomorrow, so we hope to end our trip on some more big fish.